While reading the 7.5th Floor blog, I cam across an interesting post about the use of agent-based modeling for tourism/recreational planning. The post talks about the TourSim model developed by Peter Johnson. 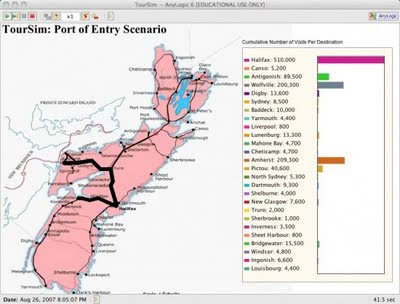 The model is created using AnyLogic and explores tourists visiting Nova Scotia and the destinations they visit under different scenarios. Peter provides a tutorial about using the model along with data sources used in creating and verifying this model. As with many other AnyLogic models (click here to see some demos), not only is it highly visual but can be run in a web browser. Further details about TourSim can be found here.